Marijuana information in her talk begins at 4:44. That section of her lecture is 30 minutes of her 50 minute presentation. Dr. Katz called marijuana,” the elephant in the room” when she referred to our current addiction crisis. This full length documentary details the negative consequences of unleashing the marijuana industry by states like Colorado and California. Marijuana edibles are widely available in Canada as the country moves toward full legalization. This alarming CBC report details the dramatic rise in overdoses and poisonings, plus explains the symptoms of overdose. Sharyl Attkinson’s Full Measure Goes to Colorado to find the downside of marijuana legalization. ONDCP Press Conference: MARIJUANA AND YOUR TEEN’S MENTAL HEALTH Nat’l Press Club, Wash DC, 5/3/05 SAMHSA/ONDCP Neil McKeganey, PhD Professor of Drug Misuse Research and Director,Centre for Drug Misuse Research Glasgow Univ, Glasgow, Scotland UK. This pot-focused educational course should be taught in every school district across America, not JUST one school in the country. As five states vote on whether to legalize recreational pot, Dr. Jon LaPook visits Pueblo, Colorado, a town that knows firsthand the impact of the legal weed business. Governor Chris Christie says he will not buy into legalizing recreational marijuana, saying it’s a gateway drug and poison. Townsquare Media New Jersey’s NJ 101.5 presents “Ask the Governor,” an hour long call-in program with New Jersey Gov. Chris Christie hosted by Eric Scott starting at 7 p.m. EDT. How Can America Be So Naive? Big Tobacco and Big Marijuana employ the SAME tactics! America was once fooled by the tobacco industry living off addiction for PROFIT. The Marijuana Industry is targeting our most precious resources- our teens and young adults. STOP the industry! Remember Big Tobacco? They are back. 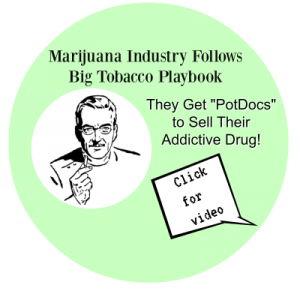 The playbook how to dupe the American public into believing 21st century marijuana (& all its byproducts) are “safe, medicinal & natural” surely is a throwback to years ago when Phillip Morris paid physicians to LIE about the so-called “harmless” use of cigarettes. For many people, smoking marijuana is not a big deal – it is, after all, the most widely-used illegal drug in the world.But today’s super-potent pot may be changing the game. Some of the world’s top schizophrenia experts, whose research is featured in The Downside of High, have found that teenagers who start smoking marijuana before the age of sixteen are four times more likely to become schizophrenic. Leading experts and critics of marijuana public policy speak out. Below, we are sharing marijuana mental health videos. Listen to Ron Coppola described what happen to his son. Marijuana triggered his son psychosis and now he has schizophrenia (prolonged psychosis). Ron is right, his story will not be seen on the national news. Implications of Cannabis as Medicine: Lessons From Colorado Kenneth Finn, MD Address to the Houston Texas Catholic Healthcare Professionals Society on Medical Marijuana in Colorado. What legalization has bought, what we know and what we do not know about Medical Marijuana. Dr. Sharon Levy of Boston Children’s Hospital discusses the effects of marijuana on youth with Grand Isle-Chittenden County Representative Ben Joseph. Dr. Brad Roberts, a Pueblo native and emergency room doctor, speaks to Smart Colorado about the misconceptions youth and young adults have around marijuana and it’s impacts on their developing brains. Dr. Brad Roberts, a Pueblo native and emergency room doctor, speaks to Smart Colorado about returning to his hometown to find how marijuana has impacted his community and the Pueblo hospitals. Dr. Brad Roberts, a Pueblo native and emergency room doctor, speaks to Smart Colorado about the experiences he has witnessed first hand in the Pueblo Emergency Room and what options patients have after they are released. Dr. Brad Roberts, a Pueblo native and emergency room doctor, speaks to Smart Colorado about the correlation between ultra-potent pot and psychosis. Exploring the Link is a national project of the Schizophrenia Society of Canada. The aim of the project is to increase awareness and understanding of the relationship between cannabis use and psychosis from the perspective of youth. We worked with the Schizophrenia Society to make this wacky little ditty to raise awareness about the connection between smoking weed and the onset of psychosis. Personal experiences as told by two young men. Smoking cannabis can lead to cannabis psychosis, causing you to lose touch with reality. Two men describe how it happened to them. Listen to the problems in Colorado schools. How much are government officials hiding? Aubree sheds light on the truth that legalizing marijuana increases the illegal market and does kill. She shares some of the stories of the people who have lost their life’s to marijuana. Dr. Lev is the Medical Director of Emergency Medicine at Scripps Mercy Hospital in San Diego. She describes how everyday she treats daily marijuana poisoning: from cyclical vomiting syndrome- a condition resulting in terrible wretching (vomiting) and severe abdominal pain caused by regular marijuana use, she treats someone in acute psychosis and agitation associated with marijuana use. Dr Lev has treated cancer patients who ate a marijuana brownie thinking it would help with nausea from chemotherapy, only to land an admission to the hospital for chest pain and palpitations; and the most reprehensible consequence from marijuana is when Dr Lev has to place a child on life support for marijuana ingestion. Dr. Lev is the director of operations of the Scripps Mercy Emergency Department, San Diego campus. She has been practicing medicine at the hospital since 1993, was board certified in emergency medicine in 1995 and re-certified in 2005. Colorado voted to legalize, promote, commercialize, and normalize marijuana. The marijuana industry produces high potency products that are designed in deceptive forms to disguise use. These products are highly accessible in our communities. Pueblo, Colorado has experienced the negative consequences of this new law. January 2014, after legalization of marijuana, social service agencies in Pueblo Colorado saw an increase in out of state individuals and families (with children) requesting shelter and services. Many of them had severe mental and physical problems. Since the voters approved the continuation of the sale of recreational marijuana, yet the harms of the drug culture continue to impact the community, a new group has formed, Pro Pueblo Co.
Pueblo, Colorado has experienced the negative consequences of legalized marijuana. The harms and the costs are minimized by the marijuana industry, their investors, and their promoters. Concerned citizens in Pueblo Colorado failed at a initiative ballot last November 2016 to opt out of A64, retail marijuana. On Thursday, October 20th, members of the medical community of Pueblo came together for a press conference to warn public officials and the people of Pueblo that there is great cause for concern related to the marijuana industry continuing to operate in this county. Dr. Steve Simerville, Medical Director, Nursery, St. Mary-Corwin Hospital. “Our public officials have not been responsible in keeping the industry in check because they have worked really hard at increasing the levels of THC to astronomical proportions…. All high-dose THC does is increase the risk of addiction and mental health problems.” Dr. Elizabeth (Libby) Stuyt. A Colorado mom warns America not to legalize marijuana and asks her town of Pueblo Colorado to opt out of Amendment 64, retail marijuana. She shares her story about her teenage son, who had access to edibles (industrial infused THC products ) in school. These products, smoking marijuana and “dabs” caused a downward spiral towards attempted suicide. Her story is not uncommon!! A Colorado mom warns America not to legalize marijuana and asks her town of Pueblo Colorado to opt out of A64, retail marijuana. She shares her story about her teenage son, who had access to edibles (industrial infused THC products ) in school. These products, smoking marijuana and dabs caused a downward spiral towards attempted suicide. The effects of marijuana on the brain of an unborn child. Predisposing children for addiction.Tamra Axworthy, Exec Director- A Caring Pregnancy Now in Pueblo, CO, Elizabeth Stuyt M.D. with Circle Program. Colorado Mental Health Institute. The effects of marijuana on the brain of an unborn child. Predisposing children for addiction. Here are the studies cited. 1. M.S. Spano1,2, P. Fadda1,2, W. Fratta1,2,3 and L. Fattore*,1,3 Cannabinoid-Opioid Interactions in Drug Discrimination and Self-Administration: Effect of Maternal, Postnatal, Adolescent and Adult Exposure to the Drugs Current Drug Targets, 2010, Vol. “We are in a crisis which calls for a paradigm shift” Parents should be concerned as this Licensed Clinical Social Worker who is a longtime rehab therapist compares use of the new marijuana derivative (dabs) to the late ’90s Ecstasy epidemic. At 53 min mark, please listen to the next 7 mins. Jon Daily, a mental health therapist, is convinced America is on course with a major collision from the newest marijuana derivative, “dabbing” triggering increased psychotic episodes as more young people use this potent drug. Dr. Boniface explains how marijuana use causes brain harms despite how millennials consider pot as a harmless pleasure. She discusses the decreased perception of pot as a risk amongst high school and young adults but the data of concern is million of young people are using not just weekly but daily as it’s becoming now the norm. Dr Bonafice says her population she treats people with psychiatric disorders (anxiety, mood disorders) even a little bit of marijuana throws them a relapse. Dr Bonafice states marijuana is a psychoactive drug and the THC property induces psychosis more. Check out the full podcast at http://louderwithcrowder.com! Is Marijuana actually good for you? We sat down for a full-length interview with Dr. Phyllis Bonafice, MD in neuropsychiatry to get to the bottom of it… Follow me on Twitter: https://twitter.com/scrowder Like me on Facebook: https://www.facebook.com/stevencrowderofficial Follow me on Vine: https://vine.co/u/1136892885917368320 Check out more of my videos! Marijuana Madness – the verdict on whether or not marijuana can send you mad? In the 1970s cannabis was presented as being cool and a harmless lifestyle herb. But the data of a new scientific study seems to suggest that cannabis causes psychosis, and scientists can even tell you how it does and who is most at risk. Uploaded by Other Side of Cannabis on 2016-02-15. Documentarian Jody Belsher on a very personal tale of “The Other Side of Cannabis: Negative Effects of Marijuana on Our Youth”. Her son became addicted to marijuana and suffered psychotic break. She started asking a lot of questions. Her documentary is what she discovered. THE OSC DOCUMENTARY film on the negative effects of marijuana on our youth–adolescents, teenagers and young adults whose brains are still forming. Other Side of Cannabis www.oscdoc.com. Uploaded by WVIIIPROductions on 2016-03-16. Uploaded by ILFamilyInstitute on 2015-11-17. The Vermont State House Special Event on Jan 27, 2016 invited Dr Bertha Madras , PhD, (Professor of Psychobiology & Psychiatry, Harvard Medical School) to present on the topic of Cannabis and Opiates. The all new 60-minute recut version of The Other Side of Cannabis. Now Available!